Swiftly moving to Plan B after world road race champion Mark Cavendish went down inside the final two kilometres, Luke Rowe (Team Sky) powered home to take stage one of the Tour of Britain. The Briton beat Boy Van Poppel (UnitedHealthcare) in a drag race to the line at Norfolk Showground, with Russell Downing (Endura Racing) third out of the fragmented peloton. Cavendish was close to the front when the fall happened, with Tour de France winner Bradley Wiggins pulling at the time. He led the group around a right hand bend, while behind Cavendish’s front wheel appeared to skid and he went down. Sprint rival Tyler Farrar (Garmin-Sharp) was one of several who also fell, thus losing out on his own chance. The crash disrupted the already-reduced bunch, and meant few were in with a chance to win. Earlier, Kristian House (Rapha Condor), Jonny Clarke (UnitedHealthcare), Rony Martias (Saur Sojasun), and Niels Wytinck (An Post Grand Thornton Sean Kelly) attacked and opened a lead of over seven minutes. House was best in the three third category mountains primes, Martias took the sprints jersey and Wytinck was most aggressive rider. Wytinck persisted after the others were hauled back 21.9 kilometres out, but was himself reeled in two kilometres later. The Endura Racing team took over from Sky and Garmin-Sharp, who had been chasing, and drilled it for several kilometres, splitting the bunch. 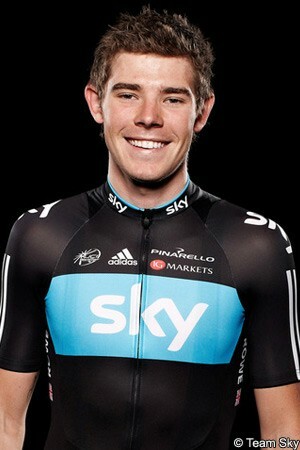 Rowe was ready to give up his chances for Cavendish but ended up being in a position to print for himself. “I think I will definitely keep the jersey for a couple of days. The last few days are really tough, we will have to wait and see, take it day by day. Huge crowds gathered at the start of stage one of the Tour of Britain, thronging Ipswich and giving the race a big send-off. Early on four riders clipped away and opened a decent advantage, with Kristian House (Rapha Condor), Niels Wytinck (An Post Grant Thornton Sean Kelly), Jonny Clarke (UniteHealthcare) and Rony Martias (Saur Sojasun) pulling well together. Martias was quickest at the Yodel intermediate sprint at Melton (km. 9.2), edging out House and Wytinck. The gap continued to grow and soared to over seven minutes just before House took the first King of the Mountains prime at Snape (km. 24.9), beating Martias and Clarke into second and third. The same finishing order settled the third category climb at Westleton (km. 49.1), where the break held a gap of over four minutes. This had dropped to three and a half minutes after 100 kilometres of racing, approximately the halfway point. Clarke was best at the Yodel sprint at Great Yarmouth (km 105.3), leading House, Martias, and Wytinck over the prime line. Behind, the bunch ramped up the speed under the collaboration of the Sky and Garmin-Sharp squads and the gap had fallen to under one and a half minutes by the time Martinas edged out House, Wytinck and Clarke for the final Yodel sprint at Coltishall (km 140.9). Perhaps sensing it was making the catch too soon, the peloton let the break’s lead go up to two minutes. That ensued the riders would still be clear for the final KOM of the day, where House again took the prime ahead of Wytinck and ensured he’d hold the mountains jersey tomorrow. The bunch had put the hammer down and grew steadily closer. The break realised the game was up and sat up with 21.9 kilometres left, but Wytinck decided to kick clear before the junction was made. He lasted two more kilometres, but his legs gave way and he was hauled back. Inside the final three kilometres, Bernie Eisel drove the bunch along for Cavendish; Luke Rowe took over with two clicks to go, but Orica Greenedge swept past and took over at the front. Sky stubbornly fought back with Wiggins moving to the head of affairs but his efforts to set Cavendish up unravelled when the Manxman went down with just over a kilometre left. Rowe shouted to the Tour winner to keep going and, led out by him, was able to put himself in the right position to fight, and beat, Boy Van Poppel to the line.